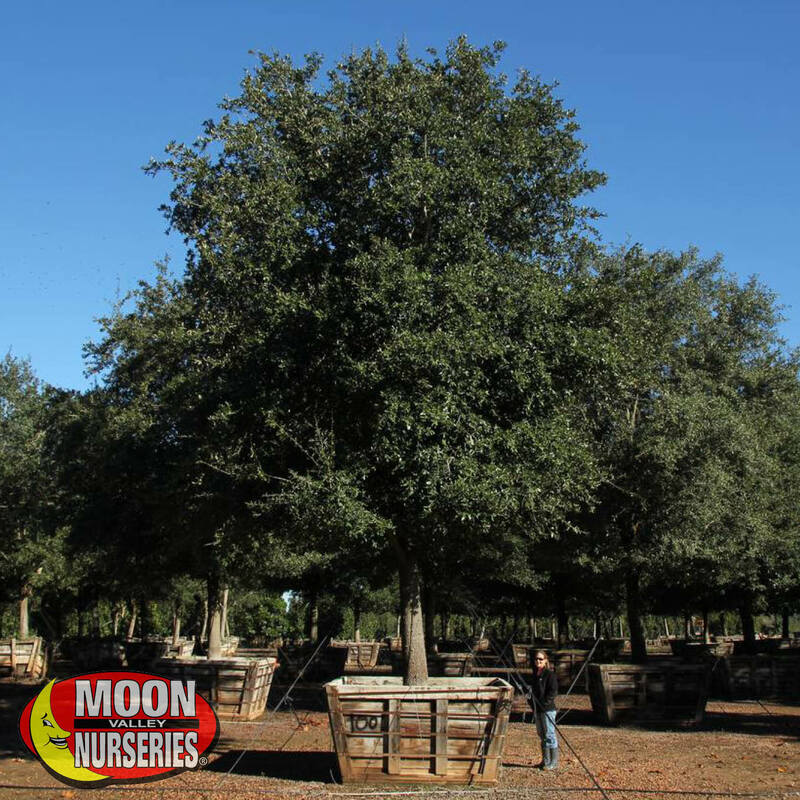 Live Oak (Quercus virginiana) – A great staple for any yard. Also known as “Southern Live Oak,” these trees are drought tolerant and require low water once established, perfect for our hot Arizona areas. Live Oaks have dark green leaves that make up the dense, wide spreading canopy that provides massive amounts of shade that brings us relief from the sun’s rays. Use the giant canopy as a shady spot for a picnic or let the kids climb up the strong limbs. Live Oaks are a clean tree so they make for great lawn trees. We also like to use them as a living privacy wall, blocking unwanted attention from neighbors or busy streets. Bonus points for their ability to tolerate extreme wind conditions! With long lives, it will be around for generations to enjoy. 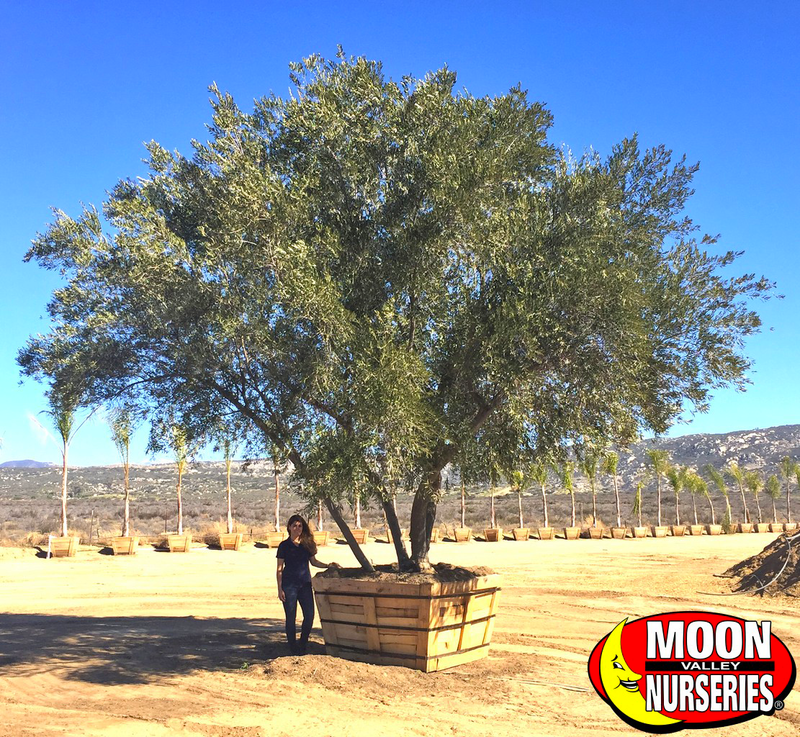 Fruitless Olive (Olea europaea ‘Wilsonii’) – Moon Valley Nurseries grows Fruitless Olive strain that is certified truly fruitless. This drought tolerant, medium sized tree is perfectly suited for a Mediterranean Southwest landscape style. Make this Fruitless Olive a focal point and install nighttime lighting in and around this tree to show off its interesting multi-trunk structure. The foliage is a stunning gray/green and silver coloring. Fruitless Olive trees thrive with full sun exposure and are able to tolerate poor, stony, shallow soils; so, you can plant this tree on a variety of land conditions. With very little water requirements once established, this hardy evergreen can grow with a wide spreading canopy, making this a great tree for use as a shade tree for a backyard entertaining area or bringing shade to sun facing rooms. Ficus (Ficus nitida) – Homeowners love this tree! Native to Asia and Hawaii, the Ficus brings the tropics to any landscape or yard. Thrives in full sun exposure and is drought tolerant, perfect for those looking to conserve water use. A wide spreading canopy provides dense shade that can naturally cool a home when planted in the proper location. We like to plant them in a yard as a specimen tree to use as a focal point in the landscape. 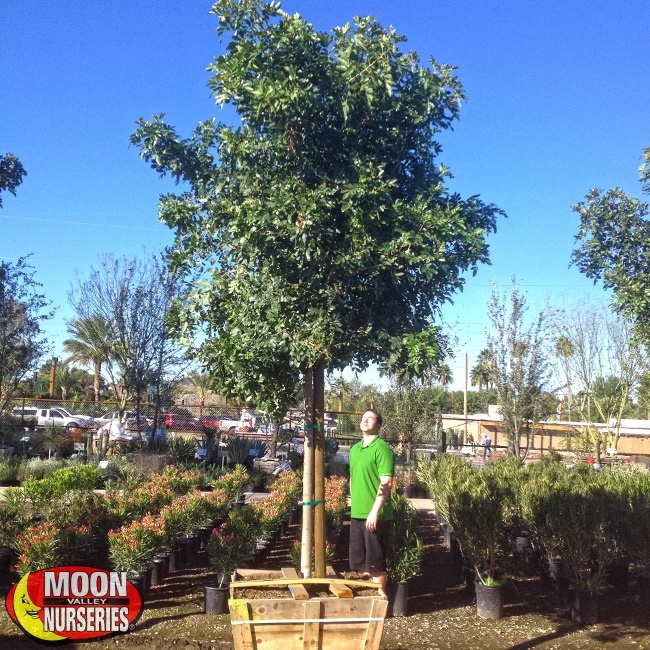 Ficus trees handle pruning into many shapes, so they can fit the look you want! 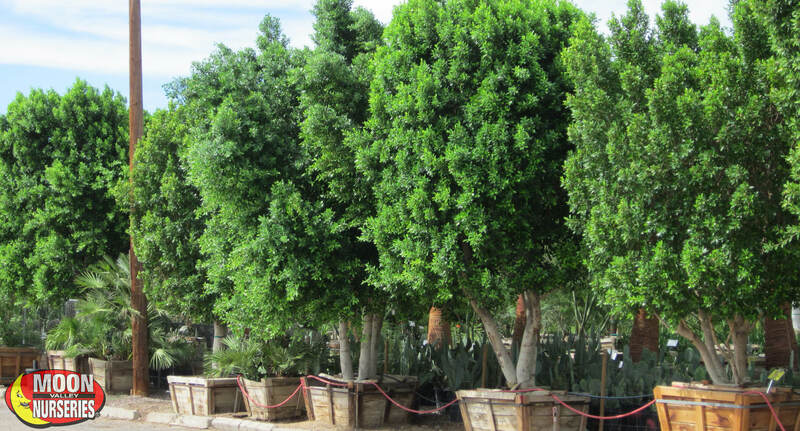 This evergreen tree thrives in desert environments, just like our Arizona landscapes! Brazilian Pepper (Schinus terebinthefolius) – This vibrant evergreen is sure to add value to any home. Brazilian Pepper trees are water-wise and require little water once established. Their glossy, dark green leaves create a wide spreading canopy that provides an abundance of shade. A perfect choice for Southwest environments due to its love of heat and its drought tolerance. During winter, bright red berries appear that are commonly used as holiday decorations; this is where its other common name, Christmasberry, comes from. If you are looking for a tree that brings in pollinators, this tree is for you. Butterflies will flock to this beautiful tree. Available in both single or multi-trunk. 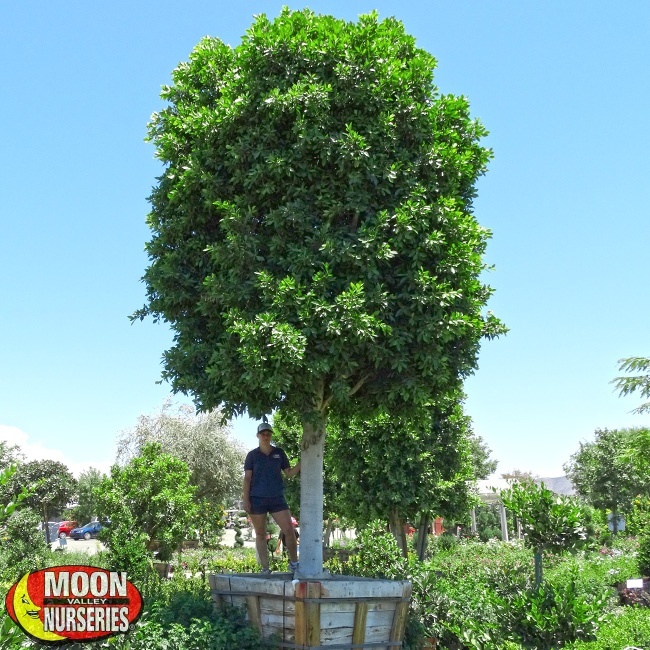 Indian Laurels (Ficus nitida ‘Columns’) – This column variety of the Ficus grows into a medium to large tree that can add instant privacy. Indian Laurels are both heat and drought tolerant, and it tends to grow faster once the heat hits – a perfect summer tree! The dense green foliage creates much needed shade during our hot summer months. It is water-wise once established. 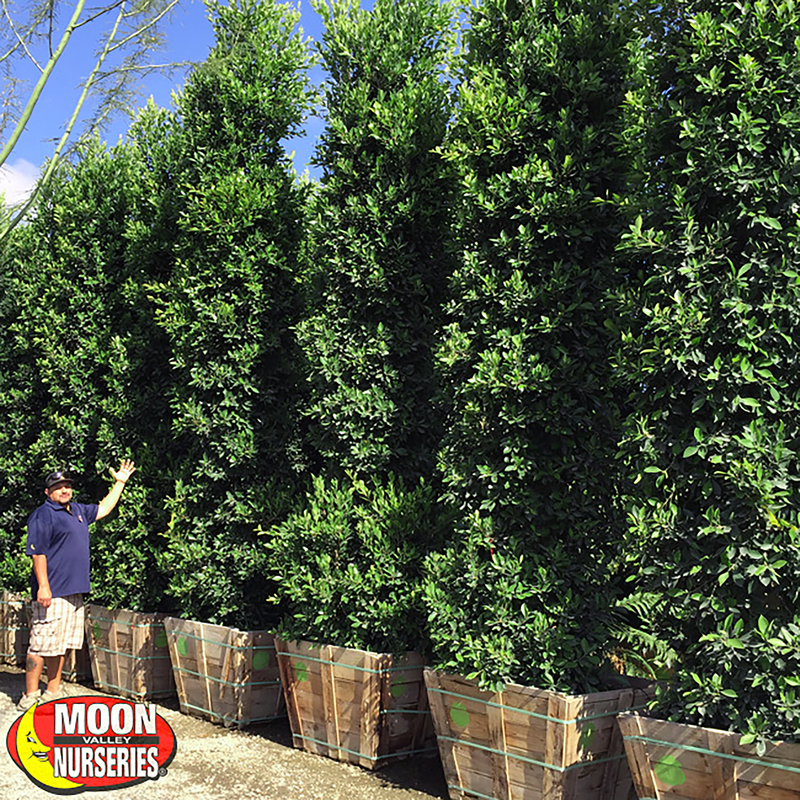 Indian Laurels can be pruned into any shape and looks great planted in rows along driveways or property borders. Depending on the look you want, let them grow tall and bushy for creating shade or keep them smaller and narrow for a more formal look.